Periodic stress and poor eating habits can unbalance your digestive system which may cause bowel urgency, nervous stomach, gas, bloating, irregularity, abdominal discomforts, and unplanned trips to the bathroom. DIGESTICALM works naturally to help avoid these discomforts and rebalance your digestive system*. What is the main ingredient in DIGESTICALM? DIGESTICALM contains 200mg of peppermint oil. What are the directions for DIGESTICALM? The directions for DIGESTICALM are to take one capsule with water 15-30 minutes before a meal, up to two times per day. How long does it typically take for this product to be effective? You can expect results within one digestive cycle. What is the duration of one digestive cycle? Digestion time varies based on individual factors such as the type of food consumed and size of the meal, but for most healthy adults it’s usually between 24 and 72 hours. Can I use DIGESTICALM continuously? DIGESTICALM is for everyday use, up to two times a day. Will DIGESTICALM relieve constipation/diarrhea/Irritable Bowel Syndrome (IBS)? 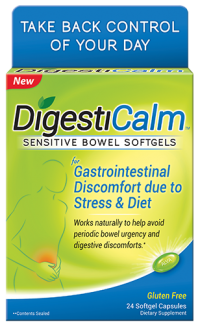 DIGESTICALM helps you avoid discomforts such as bowel urgency, nervous stomach, gas, bloating, irregularity, abdominal discomforts and unplanned trips to the bathroom*. We recommend that you ask your doctor or pharmacist before using DIGESTICALM for a purpose other than that indicated on the product package labeling and follow his or her advice. What is the expiration date for DIGESTICALM? Because DIGESTICALM is a dietary supplement, it is not required to carry an expiration date. However, we do monitor the physical integrity of the product for up to five years following the date of manufacture. If you would like to provide us with the lot number, we can tell you when the lot was manufactured. What can lead to digestive discomforts? Periodic stress and poor eating habits can unbalance your digestive system and lead to digestive discomforts such as bowel urgency, gas, irregularity and bloating. Digesticalm works naturally to help avoid these discomforts and rebalance your digestive system*. As many as 20% of all adults experience repeated digestive discomfort, often characterized by bloating, gas, cramping and other related bowel discomforts. Independent research suggests that well over half of those with repeated episodes of periodic bowel discomforts suffer bowel urgency once per month or more. Specially coated DIGESTICALM is formulated to work in the lower digestive tract, where many of these discomforts originate. The key ingredient in DIGESTICALM has been shown to support normal smooth muscle activity in the intestine that makes up the lower digestive tract*. DIGESTICALM, together with simple food choices, may offer a longer term strategy for helping to rebalance your digestive system. Importantly, DIGESTICALM is not a probiotic, and it is not a drug. It is a specially coated supplement designed to help avoid periodic bowel urgency and digestive discomforts*. You can take DIGESTICALM daily to help maintain normal digestive tract health, allowing natural digestive rhythm to return. It has been reported that diet may play an important role in lower digestive tract health and that for many, gastrointestinal distress (discomforts) may be caused by the small intestine’s inability to absorb or break down certain common carbohydrate-related food ingredients. These ingredients include, but are not limited to, fructose, lactose, fructans (simple sugars and sugar polymers found in many fruits and vegetables), and alcohols that often serve as sugar-free sweeteners, such as mannitol, xylitol and sorbitol. When these ingredients are not absorbed, they become fermented by bacteria in the digestive tract, producing gas distension (bloating) and fluid buildup that can lead to bowel irritability. This irritability may cause inconvenient and uncomfortable cramping and urgency. Those suffering from such discomforts may find relief by eliminating or decreasing consumption of certain foods. By limiting your intake of these foods you may be able to target the ingredient group or groups that are the source of your discomfort. Limiting certain ingredients from your diet may be difficult because of how pervasive they are in the foods we commonly eat every day. For your particular dietary needs, you may want to consult a professional dietician who can help you plan balanced and healthy meals that meet your specific requirements. For your convenience we have listed a number of foods that those who suffer periodic bowel discomfort may want to consider eliminating from their diet and some suggested substitutes. *These products have not been evaluated by the Food & Drug Administration. This product is not intended to diagnose, treat, cure or prevent any disease.